In today’s fast changing market landscape, customer intimacy is critical for every company’s success. 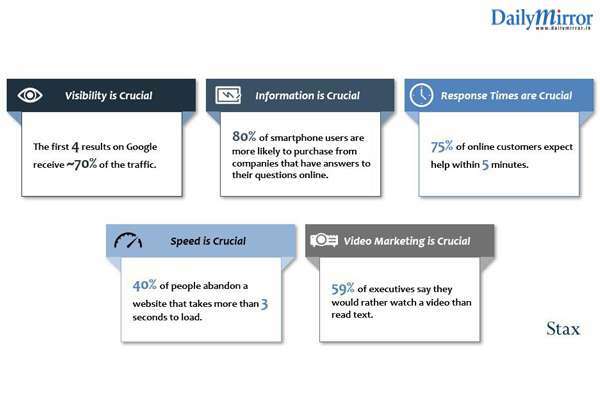 While people and processes are important, digital maturity is fast becoming the differentiator in getting traction in a crowded market place. STAX’s Digital Customer Experience Audit, which has been developed taking into account 20+ years of global corporate growth experience, helps identify critical areas of improvement while benchmarking a company’s digital footprint with peers. 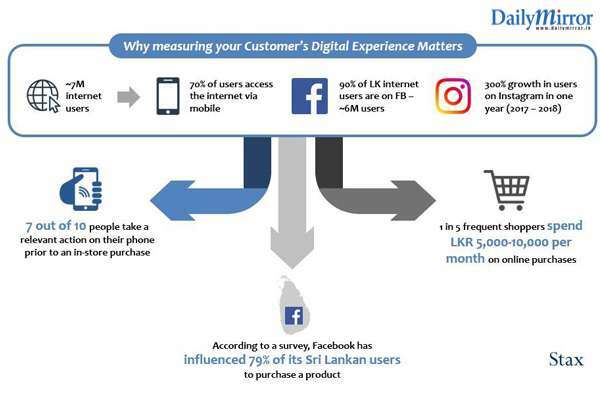 In a comprehensive island-wide survey conducted by STAX, a global management consulting firm, it was revealed that 7 out of 10 Sri Lankans take a relevant action on the internet, prior to making a purchase online or offline. Given this background, STAX has launched their proprietary Digital Customer Experience product in Sri Lanka. The service is intended to help Sri Lankan companies evaluate their customer facing digital operations i.e. website, digital marketing, social media, and online customer service, to understand strengths and weaknesses, based on global and local benchmarks and best practices. In its survey, STAX has identified that digital customers are now more geographically widespread than in the recent past, with over 80% of the connected population living outside greater Colombo, making purchases online. These purchases have also proven to be significant, with 1 in 4 shoppers spending Rs.5,000 to Rs.10,000 on their digital purchases on each occasion. The survey further revealed that the customer demographic is also now more aged with most users between 35-44 spending over 4+ hours per day browsing the internet. The audit has been developed based on the global expertise STAX has garnered through serving Fortune 500 corporations, large investment firms, and leading internet companies and is now available to Sri Lankan companies, across the B2B and B2C spectrum. The company states that they have already consulted on the audit within the banking, retail, and telecommunication sectors in Sri Lanka and is looking forward to working with a large cross-section of leading businesses to empower their customer facing digital operations.